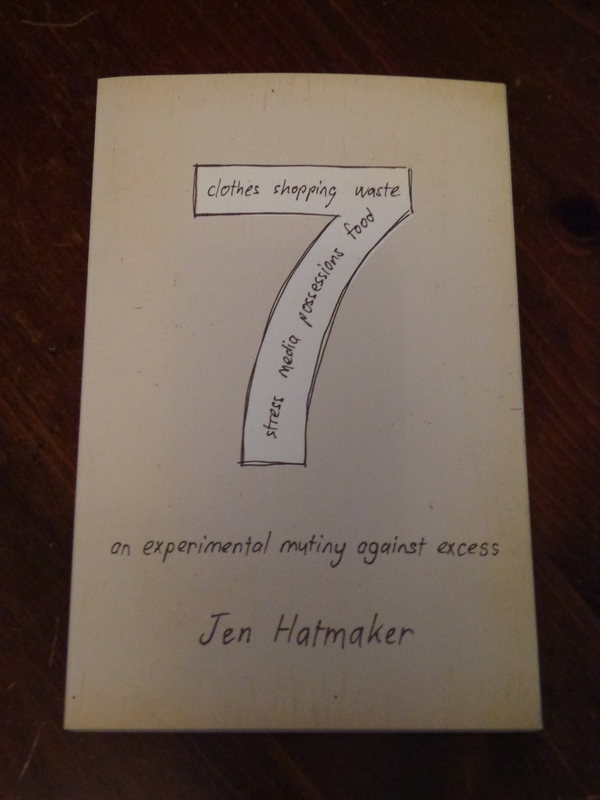 Last week I posted about the first chapter in this book where Ms. Hatmaker limited herself to seven foods for an entire month. This week the second chapter was about clothes. She decided that she was only going to wear seven articles of clothing all month (excluding undergarments) in her quest to simplify things. Please don’t get me wrong; I applaud Jen Hatmaker for attempting to do something that she felt was needed in order to get her mindset out of the materialistic thoughts that envelope a lot of the people of this country. What I disagree with was her methodology. When somebody says that they are going to eliminate excess what do you think? That they are going to clear some things out, right? At least, that’s what I do. When I get tired of having a full closet or dresser drawer I go through it and get rid of anything that I haven’t worn in quite a long while. I set these articles of clothing off to the side and they get donated to the Salvation Army. Ms. Hatmaker repeatedly comments that she counted up every article of clothing and she owns 327 pieces. Never once does she mention that she cleared some of them out and now only owns 250 pieces. Perhaps she did and just doesn’t feel that it’s worth noting. My question for this chapter mirrors the one that I had in the last chapter; what is she learning if she is limiting herself for only 30 days and after that she is allowed to fall back into her same old patterns? She learned that she was perfectly happy having so few choices to make when it came to getting dressed. She should have taken that new knowledge and went through her closets, eliminating clothing that she hasn’t worn in over a year or that she knows she will never wear. You will always have an article or two that you can’t get rid of just in case you need it (that black dress that you wear to funerals, or the cocktail dress that is worn to all fancier occasions). However, think about it, out of the clothes you own, how many do you wear on a regular basis? My other issue that I had with Ms. Hatmaker is the fact that she didn’t launder her clothes as often as I felt she should have. I realize that as a society we are much cleaner than most European nations and we probably over-launder our clothing. However, if I only have seven articles of clothing that I can wear in rotation you can bet that I’m going to be doing laundry at least once a week to wash everything. The author actually wore the same jeans four days in a row and then was amazed when she realized that they were starting to smell. She has children! Shouldn’t she realize by now that clothes pick up dirt, body odor, and sweat just by clinging to our bodies? Maybe I’m more of a neat freak than most people, but it would creep me out to know that I’m wearing a pair of jeans for the fifth time without washing them. So far the one thing that irritates me the most about this book is that she continually comments about how materialistic we are as a society, or how we should be living more simply in order to better allow Jesus into our lives, but she doesn’t seem to do anything to permanently remove the excess from her life. If she’s going to talk about only eating 7 foods then she should have said that it taught her that we’re eating a lot of unnatural junk in our diets and so she’s slowly starting to cut out high fructose corn syrup from her family’s diet. She never comes out and says this so who knows if she did or not. With the clothing she should have mentioned about how it taught her that she has too many clothes so she has gone through and cleaned out so many bags of clothing from her family’s closets and that she will shop at a thrift store when she feels the need to expand her allotment of clothing. Have you read this book? Are you reading it? What are your thoughts? I agree – seriously annoying that she didn’t seem to learn anything and had to have tons of drama about what should have been a simple exercise. I have a book coming called “Overdressed” that looks like it will everything I’d hoped Ms. Hatmaker’s clothing chapter would be. It should be interesting to compare and contrast them!